Hi all - This move was a stretch for my knowledge level, but I proceeded anyway, so I'd appreciate any thoughts or inputs about the settings. 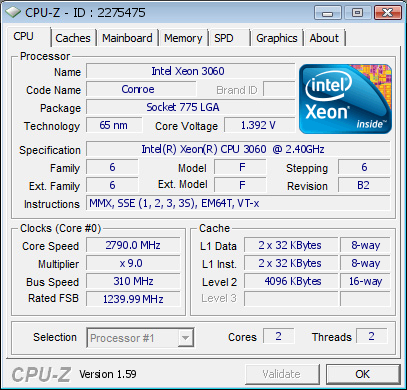 My PC runs an older Gigabyte GA-965GM-S2 with an Intel Xeon 3060 (same as Intel E6600 Core 2 Duo). The MB's offerings on setup screen are somewhat limited for overclocking, but I've managed to overclocked the CPU from 2.4G to 2.8G by stepping up the BUS from 266 to 310 (the CPU multiplier maxes out at 9), which pushes the FSB from 1066 to 1240. I've increased the memory clockings from 5-5-5-15 to 4-4-4-11, while decreasing the memory multiplier from 2.5 to 2. All seems to be running well, and the system and CPU temps have been stable at ~ 43-46°C. There are no adjustable voltage settings on this MOBO that I'm aware of. I've tried pushing the BUS up to 320 but it won't boot and kicks it back to the defaults when I go that far. Can I safely push some parameters farther, other things I can/should do, or are there any danger zones I should retreat from? TIA for any input.